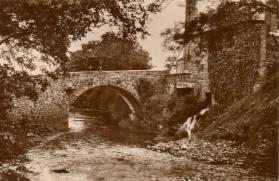 Waulkmill on the left - Tarff Mills on the right. From an employment perspective there can be no doubt that the woollen mills, established on the outskirts by the River Tarff, were of prime importance to the village. The octagonal red and white brick chimney stacks for both mills were built by local brickie Mr McKenna. The mills would have provided the largest single place of employment for the villagers, employed generations of the same families over the years and gained a well earned place in history for the Milroy family who were also responsible for housing development in the village for their workers including Milroy Terrace, which is the first white gable end on the right of the photograph below. The original mill (Waulkmill) was established in the last two decades of the 18th century by John Milroy (1713-1805) and his son Robert (1751-1814). Robert served his apprenticeship, in Mochrum , as a dyer with John Falconer, son of the dyer John Falconer who fled to Barhoise after the Edinburgh Porteous Riots. On John Falconer's death Robert took over the Waulkmill in 1779 at the age of 28. 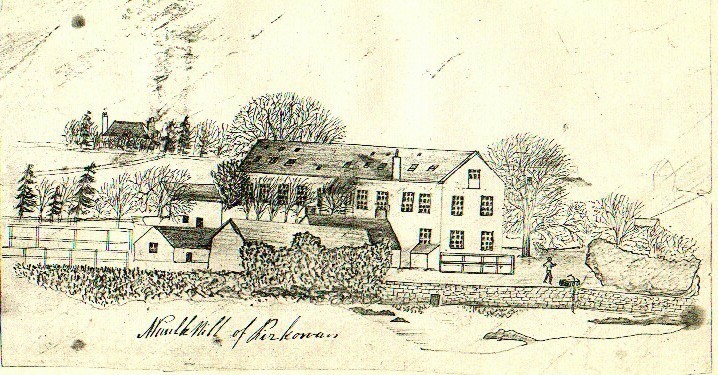 Above drawing of Waulkmill sent,in the late 1800s, by Janet Milroy Kelly to her daughter Janet Kelly (later Peacock) who was working in Boston USA. The writing on the drawing is that of Janet Milroy Kelly and the drawing was most likely drawn by her. In the accompanying letter Janet mentions Tarff House in the upper left corner which had probably only recently been built by Thomas Milroy..
(drawing and following photograph of Janet Kelly Peacock and her two daughters appear by kind permission of Bev Payne a descendant of Janet). 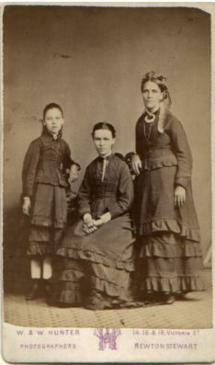 Janet is standing at the right of the photograph with daughter Margaret standing on the left and daughter Susan seated. Both Janet and Susan were grocers on Main Street Kirkcowan. The location for the mill was chosen because of the softness of the water in the River Tarff and the drop in level of the river which provided a fast current to drive the water wheel. The building was a long three-storey granite and slate construction with cast iron multi-pane windows with dormer attic windows. The main products of the mill were plain and pilot cloths, plaidings, flannels, blankets and tweeds, the latter being popularised through the influence of Sir Walter Scott. Robert married Mary Masterton from Ecclefechan in 1780 and they had 8 children - Mary, who married George McWilliam a joiner, John who emigrated to Port au Prince, James who emigrated to Trinidad, Janet who married a Mr Mason, Robert who worked in the mill for a time before emigrating to Canada in 1834, William (1) who took over the running of the mill when Robert died and Thomas who worked in the mill until he retired. The sons who emigrated to the West Indies and Canada were able to send money home to help the mill expand. The construction of a new carding mill was under construction at the time of Robert's death in 1814. The business carried on under Robert's son William (1)'s stewardship. William had married Elizabeth Hannay and had a son also named William. William took over from his father. William (2)'s brother Thomas worked in the mill until he retired. Major works were undertaken in 1822 and 1835. On William(2)'s retirement, at the height of its success, employing 60 - 80 workers mainly from the village, ownership of the mill was passed to his son William - see entry in Edinburgh Gazette below. MILROY for his sole behalf. Business shall cease and determine. William modernised and expanded the mill during the 1880s building new weaving sheds and replacing the water wheel with a coal driven engine (much later replaced by an electric engine). William's brothers John, James and Inglis assisted him in running the mills. 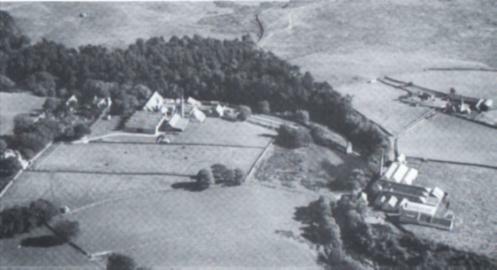 James ran the Cree Mills in Newton Stewart whilst John and Inglis helped in Kirkcowan. Inglis had been an engineer in Manchester prior to this (note: Inglis was named after his uncle Rev John Inglis, a missionary in the New Hebrides, who retired to Lincuan). Their sisters Jeannie and Jessie also worked with them prior to their marriages. Jessie married Dr Parker from Bradford and when William, who remained a bachelor, died he left the business to their son Dr Robert Glen Parker. At the time of William Milroy's death Dr Robert Parker was serving with the Royal Artillery in Europe and had to leave the running of the business in the capable hands of his mother Jessie. 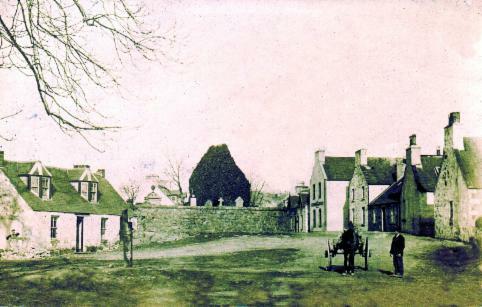 When he left the Army Dr Robert Parker opted not to join the National Health Service and decided to move to Kirkcowan. The business continued until after the Second World War when a utility mark to standardise quality was introduced by the Government.The standarised quality level was low and affected the market for high quality goods like those produced at Waulkmill. The mill stopped producing in 1950. There were still unfulfilled contracts but sadly insufficient skilled people had returned from the Second World War to operate the machines. Some machines and the contracts were sold to a firm in Bradford and the mill continued to operate as a wool buyer until 1962 when the wool business was nationalised. The Cree Mills used the top weaving shed from about 1964 - 1968. The remaining mill machinery at Waulkmill was never sold and remains at the mill to this day. (Note: The origin of the spelling of Kirkcowan has always been a subject of speculation but it is worth noting that right up to its closure Waulkmill's address was stated as Kirkowen. 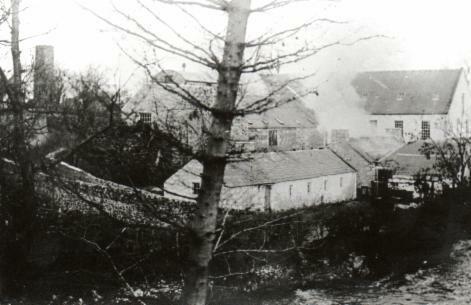 When the railway came to the village the rail company named the station Kirkcowan. The succession may seem confusing with so many of the owners named William Milroy but see the family tree below for clarification. Gilbert Milroy - ( A prominent covenantor who was transported to Jamaica after his capture. | On his safe return to Scotland, although originally from Penninghame, he | settled in the Parish of Kirkcowan ). |.... John Milroy (1680-1721) ( A tailor by trade, lived at Airyligg Kirkcowan and died in | 1721 when he fell and stabbed himself with his tailor shears). | | deciding not to go into the mill business, moved to Edinburgh. | | Thomas worked in the mill until he retired ). Born in Kirkcowan, he was educated locally then studied medicine at Edinburgh University. He did postgraduate studies in Germany at Berlin and Marburg then returned to Edinburgh as assistant to Sir Albert Sharpey-Schafer. In 1898 he was elected a Fellow of the Royal Society of Edinburgh. His proposers were William Rutherford, Sir William Turner, Sir Thomas Richard Fraser and Alexander Crum Brown. In 1902 he was appointed Professor of Physiology at Queen's College, Belfast and he got his younger brother to join him as a lecturer. He later became Professor of Biochemistry. He retired back to Scotland in 1935. He died in North Berwick on 20 March 1950. He did not marry and had no children. 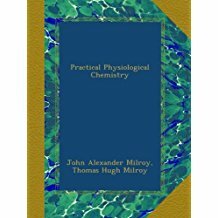 Publications: Textbook of Practical Physiological Chemistry (with his brother John Alexander Milroy) in 1904. - still available on Amazon. My family had a number of connections with Tarff Mills - my grandfather William McKie (known locally as Forester Wullie) was employed as a forester and at one stage was assisted by my father Andrew Stewart. At that time horses were used to haul the fallen trees and this is a photograph of my grandfather (on the left) with the horse and a colleague at the mill. My mother Ruby Stewart (daughter of Wullie McKIe) worked there for a time in the office, probably in the late 1930s/early 1940s, before she got married. Grandfather McKie was so fond of the apples from a particular tree in the Waulkmill garden that his employer Jessie Parker (nee Milroy) named the tree 'Forester Wullie's tree'. The tree is still in the garden. If anyone else has any stories about their family connections with Tarff Mills please email me. Click her to email me. Tarff Mill- In 1880 William Armstrong moved his business from Maxwelltown on the banks of the River Nith, Dumfries to Kirkcowan and built Tarff Mill on the opposite bank of the River Tarff almost directly opposite Waulkmill. A dam was built up river at Thomas's Dam to divert water to run the wheel (known locally as the Auld Weel) beside Lincowen (Lincuan) Bridge. The mills marketed mainly blankets but Armstrong went bust and the mill was then used by the MIlroys as a store. 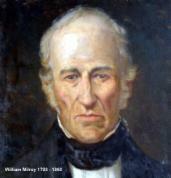 Around this time William Milroy bought back Lincuan (house) from William Armstrong. Armstrong's firm went into voluntary liquidation in 1925 (reported in the Edinburgh Gazette on 3 July 1925). 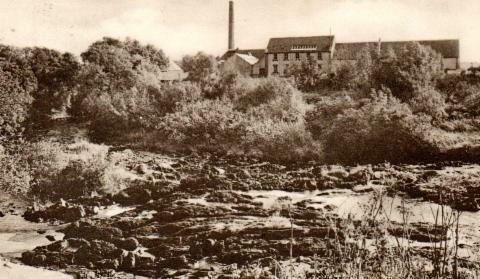 The mill machinery at Tarff Mill was sold to a new mill beside the River Cree in Newton Stewart (Cree Mills) and was still in use in the mid 1960s. Apart from some low level ruins all that remains of the mill is the tall chimney stack. WILLIAM ARMSTRONG & SON LIMITED.
" Glasgow, as Liquidator, and Mr. W. M.
JAS. A. FRENCH, C.A., Liquidator. 175 St. Vincent Street. Glasgow. William Armstrong's daughter-in-law was Margaret Corson McCallum who was the daughter of John McCallum F.E.I.S. *** the first headmaster of Kirkcowan Primary School which celebrated it's 150th anniversary in 2012. Molly Parker, a subsequent head teacher of the school, was the wife of Dr Robert Parker who inherited Waulkmill from William Milroy.